I love lemonade. I also love entertaining outside. But the bugs can interfere with all the fun and food. So I decided to embroider a cute cover for the picture. I sewed fringe onto the weight the cover down. How cute is my new pitcher cover!!! 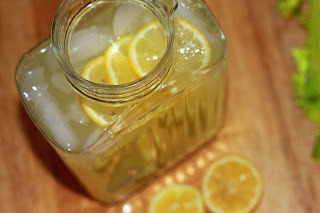 I am going to make another one for Ice Tea!!!! No bugs and a stylish cover for my lovely table. Do you know why I love you?... It's because your mind never stops!!! That is unbelievably cute and what a great idea -- I definitely don't like it when the bugs interfere with entertaining! And I surely wouldn't want someone finding a fly in their lemonade! What a neat idea! 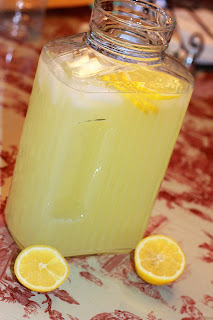 Your lemonade looks SOOO YUMMY!!!! 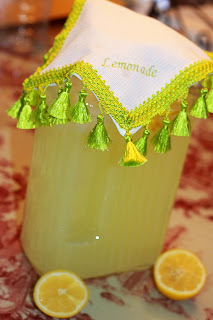 I am still drooling over the lemonade, much less the cover! YUM! What an adorable idea!!! Love it! And I love the color. Looks great with the lemons!!! Enjoy your day! You are something! What a great idea. It's so cute. Your lemonade looks delicious. Thanks for coming over and saying hi! You have a wonderful place here. I love that lemonade cover - very clever! That will come in handy this summer!